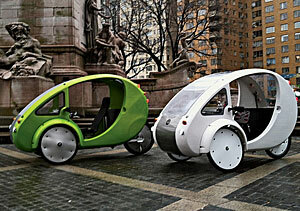 In the future, tricycles will solve all our problems? PIXIE POWER Adult tricycles—even e-tricycles—are already a thing. But are they cute enough? North Carolina start-up Organic Transit is addressing that problem with the Elf, a pedal-electric solar-powered tricycle that makes low-carbon conveyance easy and adorable. 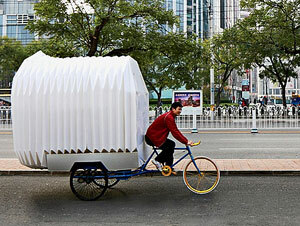 Big enough to carry an extra passenger or up to eight bags of groceries, the enclosed, egg-shaped Elf is still legal to ride on bike paths. When they cross the Misty Mountains, elfin riders can turn the throttle to get an electric boost—a lithium ion battery will take the trike 30 miles at 20 miles per hour and can be recharged from a wall outlet. Company founder Rob Cotter says the target market is people who never imagined commuting by bike. "Do you really think my aunt Kiki is going to ride uphill in the rain?" LEAN, GREEN PHILIPPINES Gas-powered trikes are popular in the Philippines, where 3.5 million are in use, but their emissions aren't: They account for more than two-thirds of the nation's transportation-related air pollution. These old-school scooters may soon be on their way out, replaced by bright blue and canary yellow electric models. 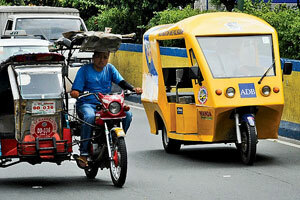 Backed by a $300 million loan from the Asian Development Bank, the Philippine government plans to replace 100,000 gas-powered tricycles with the e-trikes, many of which will be used as short-haul taxis. The switch will lower costs for cabdrivers, save the nation $100 million a year in fuel imports, and eliminate about 260,000 tons of carbon dioxide emissions annually.